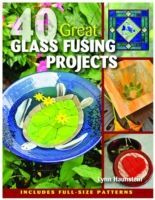 40 Great Glass Fusing Projects is a a follow up to the very popular 40 Great Stained Glass Projects, which makes glass fusing easy and accessible. Complete instructions in text and step-by-step photographs Make a wide variety of practical and decorative items - herb and garden markers, bowls, serving dishes, hanging panels, house numbers, jewelry cases, and more - by fusing glass. Includes Full-size patterns, materials lists, and beautiful finished project photos are included for each project.